Dan Seagrave cover art, a raw and aggressive sound, technicality matched by brutality; Desecrator’s Subconscious Release should have been huge! Instead, this cult item is merely a footnote in death metal history but it deserves to be held in considerable high regard for delivering a focused lesson in classic death metal violence. Following a similar path travelled by Death (Leprosy-era) and Sweden’s Dismember, Desecrator’s groove heavy onslaught revelled in muscular, lengthy and, above all, catchy songwriting. 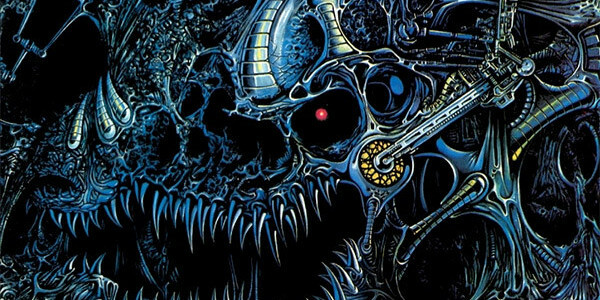 While a slight sense of repetition sneaks in when absorbing Subconscious Release in its entirety, the same accusation can be made of many a death metal album that bludgeoned the listener with ostensibly the same sound – Deicide being one of them – and nobody gave two shits! Desecrator’s one and only album should have been enough to endear them to the masses as it’s an outstanding moment of UK death metal mastery; backed by a collection of expertly delivered death metal songs. Haven’t heard it? Go discover! Transcending Records Signs New Band Featuring Ex Members of Carcass, My Dying Bride, Malediction & Bal-Sagoth! A death metal monster in the making! Despised Icon Announce 2018 UK Show Dates! We. Can. Not. Live. Without. These. Albums!